Continuity mistake: In the 1991 flashback, Jamie is already engaged to Paul and is shown with long hair. However, in the 'Cold Feet' episode, Jamie is shown with short hair. Since the 'Cold Feet' episode was set in February of '91 and the flashback from this episode was set in late March or April of '91, these two episodes don't match up. Continuity mistake: In 2006, after Paul learns that Jamie is pregnant with their second child, Paul buys her a double baby carriage as a present. He says "Two kids, one carriage. One big happy family." A sweet gesture, but in the year 2006 Mabel would be 8 or 9 years old, far too old to ride in a stroller. Plot hole: In this episode, a very star-struck Paul meets Jerry Seinfeld on the street. It's not clear whether Jerry is playing himself or his Seinfeld character, but either way it's a mistake. 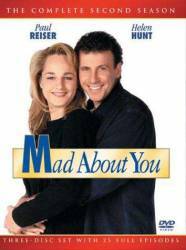 If Jerry was playing himself, it's a mistake because Mad About You did a crossover episode with Seinfeld in its first season, so it would be impossible for Seinfeld (the TV show) or Jerry Seinfeld the actor to exist in the Mad About You universe. If Jerry was playing his character, it's a mistake because it was established in that crossover that Paul and Jerry used to be neighbors and knew each other fairly well, so Paul wouldn't be at all star-struck.